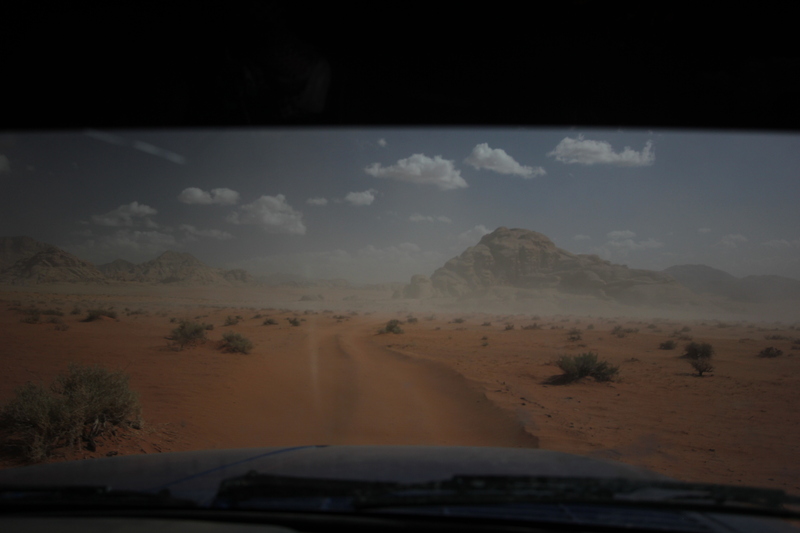 Passing the main entrance of Wadi Rum, the bus enters into the Wadi Rum village. Made famous by TE Lawrence’s book Seven Pillars of Wisdom and the film Lawrence of Arabia, the desert had been under the stewardship of the nomadic Bedouins for centuries. 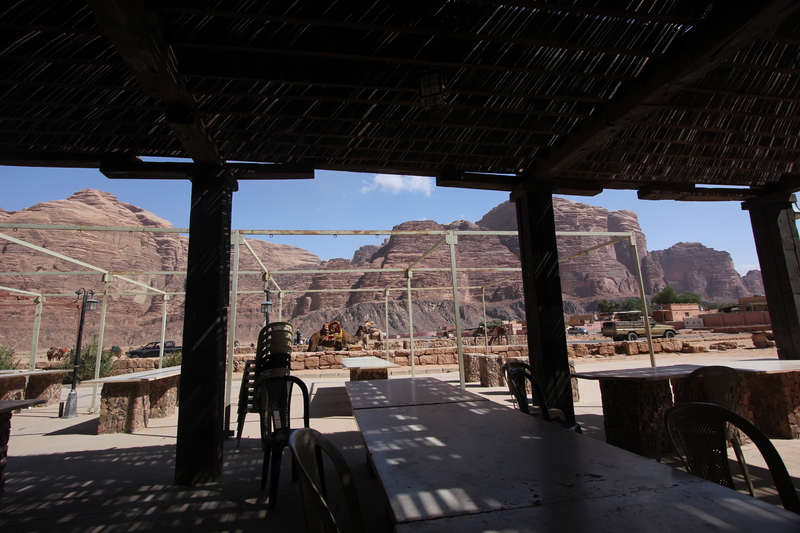 Now, many of the remaining 5000 Bedouin have chosen the settled life in the Wadi Rum village situated at the north of the desert. The visitor centre in the village is surprisingly well built, in contrast to shabby looking houses surrounding it. It’s a long open building, with a yard in the front with many benches and tables. I get out of the bus and spot a slim man in a simple black tunic head scarf, standing at the side of the courtyard. There’s a quiet but sturdy charisma in the way he holds himself, and even before getting to see his face properly, I know it’s Mahdi, the head of the Wadi Rum tour group whom I’ve been corresponding with to discuss my travel arrangements. We exchange greetings and sit down on the bench. He brings me Bedouin tea (black tea with herbs and lots of sugar) in a small glass cup and explains to me where I would be travelling on a fold out map of the desert. There’s something about the way he speaks that makes me shy. Softly spoken with a hint of Arabic accent, each word meaningfully uttered to form carefully thought out sentences. There is no room for silly chatters in his presence. After his introductory talk of the desert, we sit there in silence for a while. I’m not sure whether he’s waiting for me to take my time of rest, or I’m waiting for him to tell me we are ready to go. Too shy to ask, I just sip my Bedouin tea and stare down, studying intently every single font on the fold-out map. 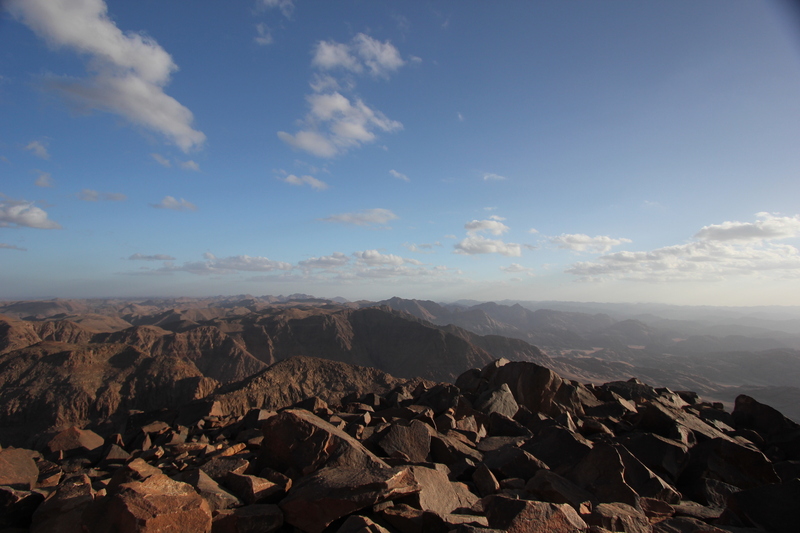 Today’s plan is to drive to the southern end of the desert and hike a mountain called Um Ad Dami . 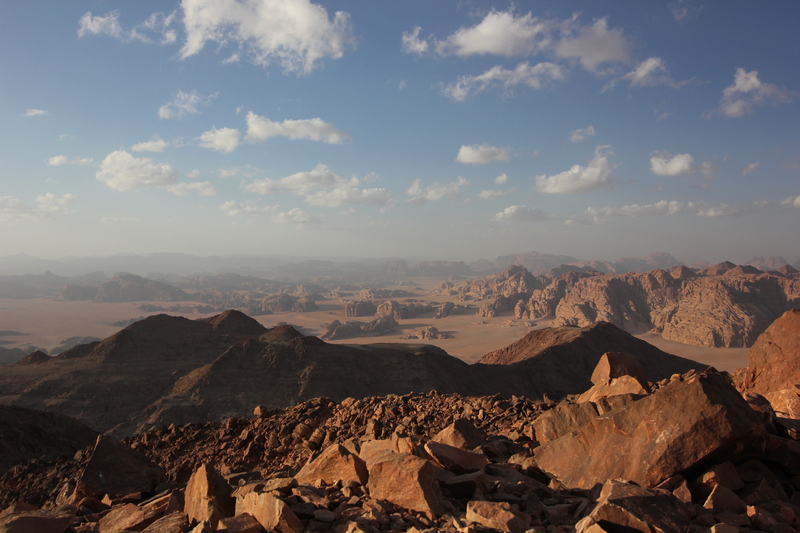 It is more than 1,800 metres high and is the highest peak in Jordan. My guide is a 24 year old boy called Id, with a slightly chubby face that looks like he still has his baby fat. The initial awkwardness for meeting for the first time fades out quickly and we soon get on like a pair of old friends. ‘Are you married?’ He asks me, as everyone does here in Jordan. I shake my head and he asks again. ‘Then why are you wearing the ring?’ pointing to the fake wedding ring I’ve been wearing while travelling by myself, in case of any unwanted advances – ‘Oh, my husband will be here any second’ would be my cover story while showing my ring. I never got to use it though – I couldn’t bring myself to lie. ‘No, I’m not married’. ‘What’s the ring for then?’ He asks and I just shrug my shoulder, not really wanting to explain myself. Then I also notice a ring on his left hand. ‘Are YOU married?’ He shakes his head and I raise my voice. ‘Why are YOU wearing a ring then?’, exactly imitating his intonations. ‘I’m married to Jordan’, he cheekily replies to which I bounce off by proclaiming, ”I’ll marry Wadi Rum then”. We both giggle. After a long, long drive, we finally reach the southern end of the desert. Only carrying two bottles of 1.5 ltr water on Id’s backpack and a DSLR with my Canon EF-S 10-22 mm lense, we set off the hike of Um Ad Dami. It seemed like a plain rock mountain from afar but up close it’s actually full of plantations. Only that they are grey, short, and spikey. Not the lucious green ones I am used to seeing in the mountains in Korea. As we zigzag our way up, Id frequently stops so that I could get my breath back and take a sip of water. The Kenyan cloth I draped over my head and shoulders provide me with some sort shade from the sun, but the heat is so strong that covering only makes it hotter and sweatier. Id comes and makes it into a headscarf by wrapping it around my forehead in Bedouin style. It cools me down immediately and makes me more relaxed as I no longer have to constantly raise my had to wipe the forever dripping sweat from my face. 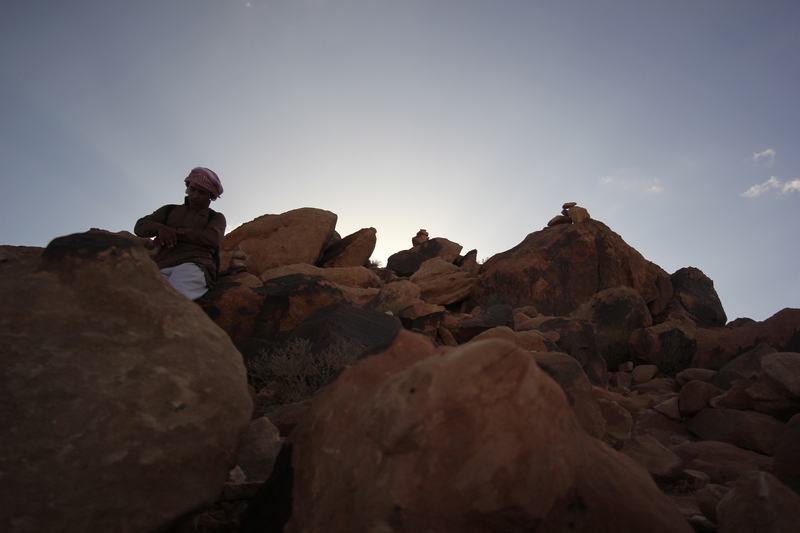 ‘Long time ago, there was an American tourist who sneaked out the camp and climbed … without a Bedouin guide. Instead of zigzagging, he climbed vertically, fell off the mountain and died’. Our conversation fades out as we get closer to the summit. My energy slowly draining out, I have to bite my tongue from pestering Id with ‘Are we there yet?’ every ten minutes. When we finally reach the top, we plop ourselves on the rocky ground and take big gulps of water. ‘That’s Israel, and that’s Saudi Arabia. I would have taken you to see my family tomorrow but they are now camping in Saudi.’ Explains Id with a cigarette in his mouth. ‘You can just go to Saudi Arabian part of desert from here?’ ‘Yeah we just pack and go’. I am slightly disappointed that I don’t get to see the real nomadic family life. ‘You know, Koreans shout Yah-ho whenever we reach a mountain top’. ‘Yah-ho!! !’ Id shouts into the distant mountains. ‘YAH-HO!’ I follow suit. Yah-ho..Yah-ho..Yah-ho…. A multiple layers of echoes come back at us, as our voices hit against many mountains and reflect at different points of time. I’ve never heard an echo like this before, and me and Id spend a good ten minutes shouting as loud as we can in all directions. ‘We better get down now. The sun will set soon. We will have dinner at the camp and there will be some musicians’. It’s another hour of drive back to the campsite, and the White Desert that we drive through turns dark pink as the day darkens.